The things you learn at your first job (no matter what it was) will follow you wherever you go. 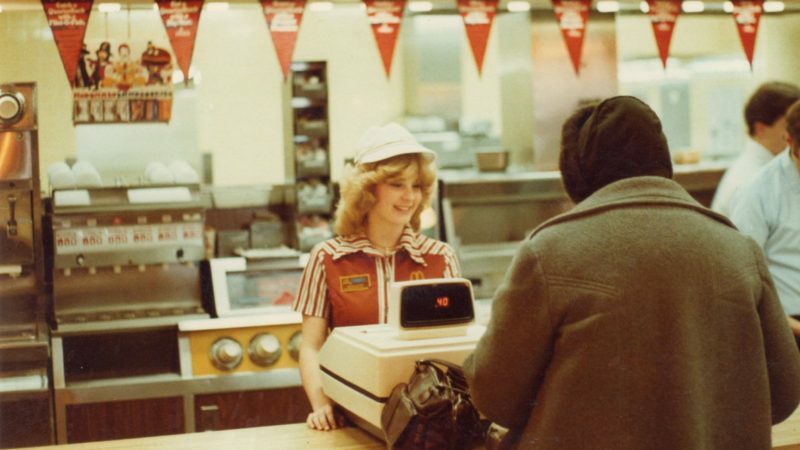 My first summer job after starting college was as a fast food worker/drive-thru attendant, and more than once I felt like I was dragging myself out of bed for a paycheck. And while at the time I rolled my eyes at spending all day boxing french-fries and having to wear a truly embarrassing “Ask Me How I (Lobster) Roll” t-shirt, I now appreciate how time in the service industry taught me to graciously deal with hard-to-please customers and get things done quickly and correctly during a crazy 6:00 pm dinner-rush. Everyone’s got to start somewhere. Here at kununu, our employees have their fair share of odd and unforgettable first job experiences. No matter how far along you are in your career path, you can always look back at the different points in your career and find some important (chicken) nuggets of wisdom to use in your current position. Getting through a tough shift or dealing with a demanding project is all about maintaining a positive and optimistic mindset. Bosses want employees who tackle problems with enthusiasm and grit rather than complaining and breaking down every time they get tripped up by an obstacle. You most likely won’t get to choose your coworkers, schedule, or commute length, but you can always choose how you respond to any non-ideal workplace scenarios that may pop up. kununu’s VP of Marketing, Dan Sirk’s first job was anything but glamorous. As a teenager, he worked hauling manure for a landscaping company. Although the work was tiring (and smelly!) he still thinks everyone should try to find the gold beneath the grime. A former barista, our PR Director believes in seeing every job, even when it’s not in your field, as an opportunity to learn new skills and gain experience. She views her first gig as not just as “pouring coffee” but as a pathway to valuable people skills. When you’re the new person at a company it’s your responsibility to show your employer what you can offer them and why you deserve to be there. Early on, it’s important to maintain a reliable and composed image in the office that makes people feel that you can be trusted with important responsibilities. When you’re given a thousand new tasks to finish by the end of the week, your first concern shouldn’t be ‘How am I going to get all of this done? !’ Instead, you should take a deep breath, look over the list, and ask yourself “What things are the most important to helping the company meet our goals?” and start there. If you’ve ever worked behind the counter of a coffee shop or manned a mall kiosk, you’ve known the struggle of dealing with hard-to-please customers. People skills are a huge part of any job, and its important to know how to deal with all kinds of people. As a former brand ambassador for a soymilk company and a bartender at a sports bar, kununu’s Linda Le Phan definitely understands the importance of keeping a smile on your face and remaining calm and collected when dealing with demanding customers. “Put the customer above everything else, and keep them happy,” advises our Marketing, Product and Business Development leader Aaron Prebluda, whose first work environment was in the kitchen of a bustling restaurant. Starting any new job is a scary experience. Whether you were hired to fill a recently created company position or are taking over the role of an old worker, it can be awkward trying to fit in with an office where everyone already seems to know each other. One of the easiest ways to feel more comfortable during your first few weeks is by working closely with coworkers and integrating yourself into their team. Networking isn’t just important during the job search. You need to learn to continue networking throughout every phase of your career. Cooke advises all new employees to find a balance between being protective with their time and forming business partnerships. “Those collaborative relationships fueled by support and accomplishment are priceless and timeless,” he said. At the end of the day, kununu employees understand that work should be inspiring and engaging. If you’re dedicating 40+ hours each week of your life to something you should be active, excited, and curious about the new lessons your job can offer. So whether you’re bussing tables, mowing lawns, or selling sweaters, remember that it’s not the job title that matters, it’s what you make of it.